When the noted architect Sir Robert Taylor died on 27 September 1788, he left behind a codicil to his will which stipulated that, after specific allocations had gone to his wife and others, the residue of his considerable fortune (which at his death stood at some £180,000), be left in the first instance to his son and, in the event of his dying without issue, to the University of Oxford. This bequest, the codicil stated, was to be used for buying freehold land in Oxford and constructing upon it an institution ‘for the teaching and improving the European languages’. 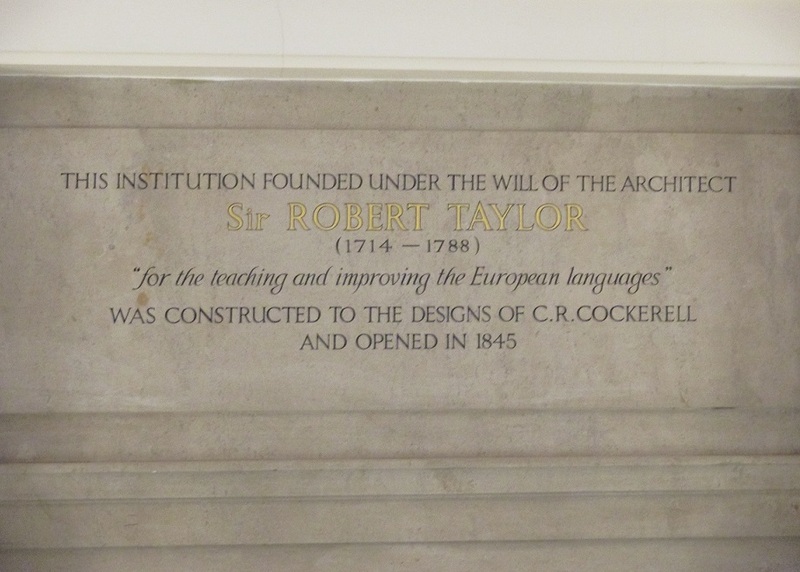 These words, engraved in stone, dominate the grand staircase which leads to the Main Reading Room of the Taylor Institution Library, the establishment ultimately founded as a result of Sir Robert’s generous donation. The phrase, therefore, is likely to have penetrated the consciousness of frequent visitors to the Taylorian. Readers are much less likely, however, to have heard of Sir Robert’s son, Michael Angelo Taylor. Little do they know that, had his position, following his father’s death, prevailed the Taylor Institution and its library might never have been realised – at least, not in the form that it exists today. Born in 1757, Michael Angelo Taylor was the only child of Sir Robert Taylor and his wife, Lady Taylor. After spending time at Westminster School, he received legal training at the Inner Temple and at Lincoln’s Inn, and in late 1774 he was admitted to Corpus Christi College, Oxford. Seemingly headed for a career in the law, he was called to the bar three weeks later. He completed his BA in 1778, and subsequently received his MA from St John’s College, leaving in 1781. By then, it seems, his interest in the legal profession had waned, and he had cultivated an ambition to make his way in politics. In 1784 he became MP for Poole, embarking on what would be a long, noteworthy, and quite successful career in Parliament. His life after leaving Oxford, however, was not to be without difficulty or controversy. Significantly, after Sir Robert died in 1788, Michael Angelo set himself on a collision course with the institution at which he had studied. Apparently not content with the £50,000 that his father had left to him specifically, he chose to contest the will, as well as the codicil to it which set out the bequest to the University. Thus, the University found itself embroiled in a drawn-out legal battle which was to rumble on until after Michael Angelo himself died in 1834. Papers deposited with the University Archives tell the story. Despite the University’s vigorous assertion of the ‘force and validity’ of the crucial codicil, whilst Michael Angelo remained alive no settlement was reached between the two parties regarding Sir Robert’s bequest. Initially, a judge in the Prerogative Court of Canterbury pronounced against the validity of the codicil establishing Sir Robert’s intention to leave part of his fortune to the University. This was largely, it seems, due to the fact that Sir Robert had never actually attached his signature to the codicil. (It appears that a considerable portion of the University’s case centred around attempting to prove that Sir Robert had intended to do so, and was prevented only by the failures of his solicitors.) Although the High Court of Delegates reversed this decision following an appeal by the University, letters of administration with the will and codicil annexed were granted to Michael Angelo in 1795. Michael Angelo thus ‘possessed himself of all the real and personal estate of his father’ and ‘intermixed’ it with his own monies and property. In 1817 he offered to settle the University’s claim on his father’s estate for £50,000 Irish currency (the majority of the estate was in property in Ireland), but the University seems to have declined this proposal. The fact that Michael Angelo could draw upon the entirety of his father’s estate granted him a considerable degree of financial security, and no doubt allowed him to focus his energies more completely on his political career – a career which was to gain him much public notoriety. Having begun his time in Parliament as a follower of Pitt, he later allied himself with the radical Whig Charles Fox and favoured parliamentary reform. Over time he repeatedly found himself the subject of controversy, and became one of the preferred subjects of the satirical printmakers of the day, the most notable of whom being James Gillray. Often referred to as the ‘chicken of the law’ (a title he had inadvertently bestowed upon himself when, during a debate in February 1785, he described himself as ‘but a chicken’ in his profession,) he was frequently depicted as a diminutive figure with treacherous tendencies. One print published in May 1797 (Fig. 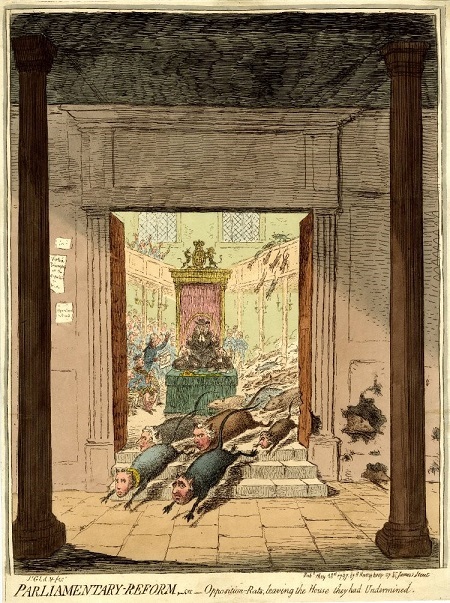 3) – a satire on the decision of Charles Fox and several of his followers among the opposition Whigs (of whom Michael Angelo was one) to secede from Parliament in 1797 after calling for reform – provides a colourful example. Here he appears in the form of a small rat – one of several seen scampering from the Opposition benches and out through the doors of the House of Commons. In another print, published later that year (Fig. 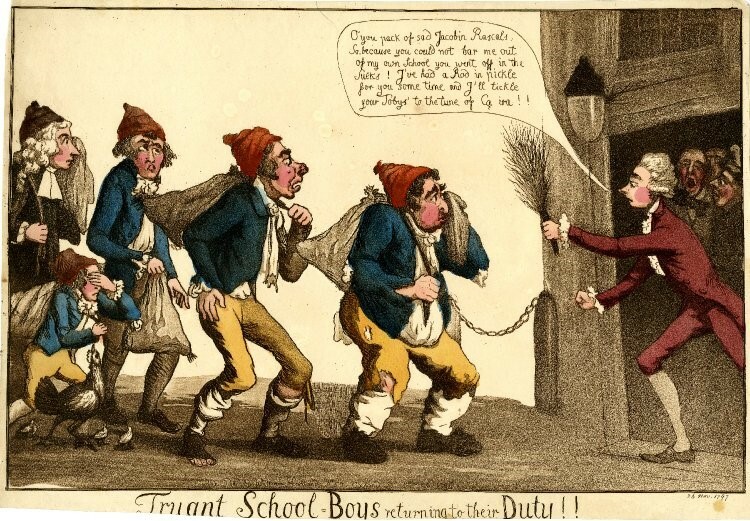 4), he appears in a procession of ‘truants’ (that is, opposition Whigs who had seceded from the Commons) who are seen trudging reluctantly towards an angry-looking Pitt as they return to Parliament. Michael Angelo (second from the left) is here depicted as a miniscule figure, and one who has been humiliated – he is clearly embarrassed (he covers his face with his hand) – and a hen and her chicks can be seen at his feet. In depicting him in this way, the anonymous maker of this print perhaps sought to pierce through Taylor’s apparently pompous demeanour. Also noteworthy is the fact that all of the ‘truants’ wear bonnets-rouges, the implication being that they have revolutionary ambitions. Clearly, Michael Angelo was a divisive character whose behaviour inspired discussion and frustration in a number of different quarters, of which the University of Oxford was only one. It was only after Michael Angelo’s long career in public life was brought to a close by his death in 1834 that the battle over his father’s fortune was finally concluded. Michael Angelo’s proposal of settling the University’s claim on Sir Robert’s estate for a sum of £50,000 appeared again in his will, and was again rejected by the University, which sought a greater amount. However, as Michael Angelo had intermixed his father’s estate with his own monies, it was now impossible to ascertain exactly how much of it had been left in residue after payment of his debts and legacies. In the end, an agreement between the University and John Vane (a relation of Michael Angelo’s late wife) was reached in November 1835, whereby the University of Oxford received the sum of £65,000. 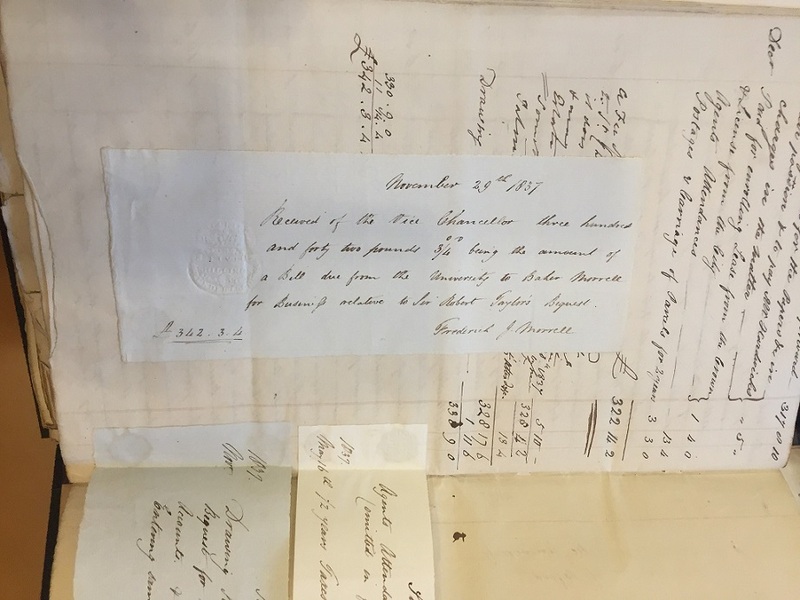 Several documents held in the University Archives shed some light on the lengths that senior figures within the University went to in order to finally obtain these funds. 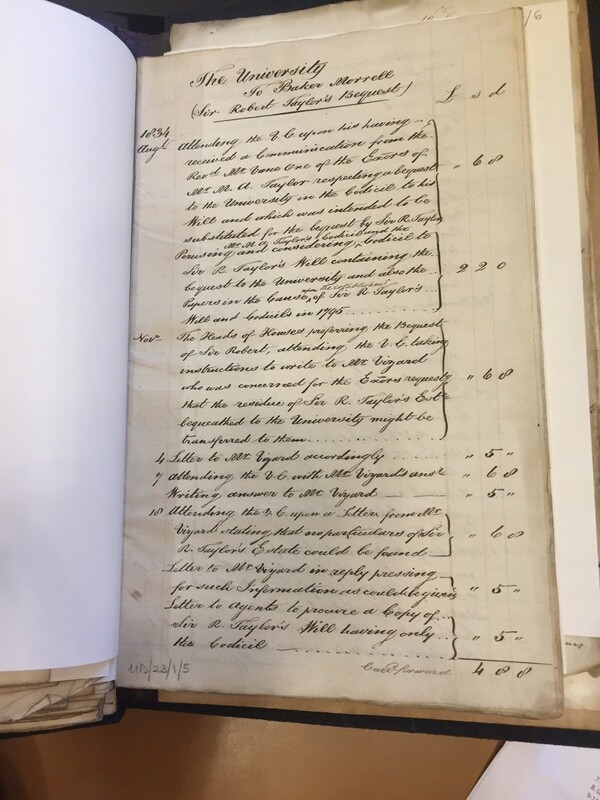 One particularly interesting document (UD/23/1/5), which lists monies paid by the University in 1837 to a solicitor named Baker Morrell, reveals how legal proceedings relating to Michael Angelo and his father’s bequest in the years prior cost the University large sums of money in lawyers’ fees. The first page of this document alone lists £4 8s 8d paid to Morrell for, among other things, ‘Perusing and considering Mr M.A. Taylor’s codicil and the codicil to Sir R. Taylor’s will containing the bequest to the University and also the papers in the cause upon the establishment of Sir R. Taylor’s will and codicils in 1795’ (see Fig. 5). The document runs to several pages in length, and on the final page the total sum paid is given as £342 3s 4d – a not inconsiderable amount, being equal to around £28,500 in today’s currency. The list is seemingly exhaustive, even including £3 3s for ‘Postages and carriage of parcels for 2 years’. Fig. 7: A note, signed by Frederick Joseph Morrell (1811–1882), the son and partner of the solicitor Baker Morrell, attached to UD/23/1/5 (see Fig. 5), University of Oxford Archives. The note acknowledges receipt of payment from the University ‘for business relative to Sir Robert Taylor’s bequest’. The foundation of the Taylor Institution, then, was a messy business. Thanks to Michael Angelo, the University had already expended a considerable amount of time and money before any meaningful plans for its construction could be made, let alone those for its character or constitution. When the necessary funds had finally been received, they were put towards a project whereby land was acquired from Worcester College, and a building which combined a modern languages institution and a University art gallery (later to become the Ashmolean Museum) was erected on the site, designed by C.R. Cockerell (son of Samuel Pepys Cockerell, who had been a pupil of Sir Robert). The Taylor Institution Library opened, at long last, in early 1849, sixty-one years after the founder’s death. Simon Bailey, Keeper of the University Archives, for permission to reproduce extracts relating to Sir Robert Taylor’s Last Will and Testament. Jill Hughes, ‘Taylor Institution Library’, in B. Fabian (ed. ), Handbuch der historischen Buchbestände in Deutschland, Österreich und Europa, Hildesheim, 2003 [Online ed., http://www.b2i.de/fabian?Taylor_Institution_Library]. Roland Thorne, “Taylor, Michael Angelo (bap. 1757–1834)”, Oxford Dictionary of National Biography, Oxford University Press, 2004 [online ed., Jan 2013, http://www.oxforddnb.com/view/article/27067, accessed 22 Nov 2017]. ‘TAYLOR, Michael Angelo (1757-1834), of Cantley Hall, nr. Doncaster, Yorks. and Whitehall Yard, Mdx.’ The History of Parliament: the House of Commons 1820-1832, ed. D.R. Fisher (CUP, 2009) [Online ed. 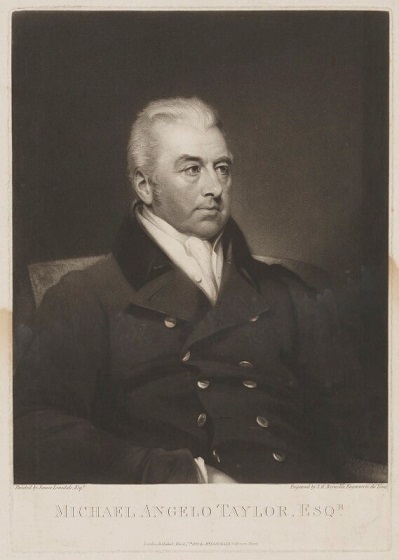 : http://www.historyofparliamentonline.org/volume/1820-1832/member/taylor-michael-1757-1834, accessed 16 Mar 2018]. ‘2nd Session of Michaelmas Term, to wit, Friday the 14th day of November 1788’. University of Oxford Archives, UD/23/1/2b – see Fig. 2. John Harris & Malcolm Baker, “Taylor, Sir Robert (1714–1788)” Oxford Dictionary of National Biography, Oxford University Press, 2004 [Online ed., Jan 2013, http://www.oxforddnb.com/view/article/27077]. In UD/23/1/2b it is stated, for example, that ‘it was his intention to sign [the codicil] […] and was accordingly by his own desire raised up in his bed in order to sign the same’. These and other details relating to the legal dispute are set out in a University document headed ‘Sir Robert Taylor’s Bequest to the University of Oxford’, University of Oxford Archives, UD/23/1/1-6. This detail is noted by former Taylor librarian Giles Barber, who provides a succinct overview of the foundation of the library in his chapter entitled ‘The Taylor Institution’, in M.G. Brock & M.C. Curthoys (eds. ), The History of the University of Oxford. Volume VI, Nineteenth-Century Oxford, Part 1 (OU), 1997), pp. 632-4. For an overview of Gillray’s work and significance, see, for example, Richard T. Godfrey & Mark Hallett (eds. ), James Gillray: The Art of Caricature, Tate Publishing, 2001, and Draper Hill, Mr Gillray, the Caricaturist (London: Phaidon), 1965. Thorne, ‘Taylor, Michael Angelo’ (see note 2). This is recounted in the document entitled ‘Sir Robert Taylor’s Bequest to the University of Oxford’, University of Oxford Archives, UD/23/1/1-6. The Bodleian Library holds papers relating to Baker Morrell, as well as his father, James Morrell (also an Oxford solicitor). See http://www.bodley.ox.ac.uk/dept/scwmss/wmss/online/1500-1900/morrell-enclosures/morrell-enclosures.html. Barber, ‘The Taylor Institution’, p. 633 (see n. 8). This entry was posted in History of the Library and tagged Michael Angelo Taylor, Sir Robert Taylor on 3 April 2018 by Clare Hills-Nova.